Mini MP3 Portable Digital Players w/ Earphones (Several Colors): $6.35 w/ Free Shipping! What great stocking stuffers these would make! 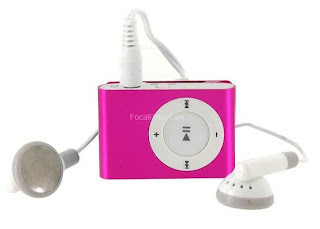 At FocalPrice today, you can get a Mini MP3 Digital Players for just $6.35 with free shipping! There are several colors to choose from. These little MP3 players have pretty good reviews, and would make the perfect first gadget for the little one in your life! To make this sale even better, if you buy 3 or more, they're just $5.46 each and if you buy 5 or more, you can get them for just $5.30! If you want to buy a whole bunch, 10+, they're $5.18 each. This would be great if you like to donate toys for the holidays! Insert a Micro SD card to enjoy your music. Built-in Li-ion battery with long working time. Plug: USB standard plug with high speed. Mini size with a flip for extremely easy carrying. Comes in blue, silver, green and pink. Support Micro SD card up to 4GB.